These tires feature especially supple casings, which make them especially fast and comfortable. I was skeptical whether the great ride of the standard Grand Bois tires could be surpassed, but these tires are yet another big step up. 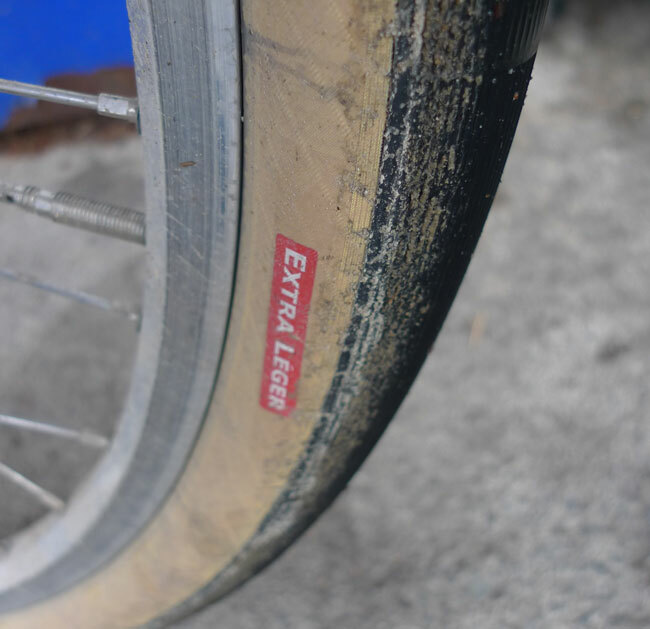 The Extra Léger tires appear to be as durable as the standard Grand Bois tires. The tread is the same rubber and thickness, so they last a long time. They don’t seem to get more flats, either. I’ve been riding my Hetre Extra Légers (650B x 42 mm) on all kinds of paved and unpaved roads since last autumn now. After 4000 km (2500 miles) only the rear tire is showing a little wear now. I expect them to last at least another 4000 km. This excellent durability means that there are no trade-offs for the extra suppleness and speed of the Extra Léger tires, apart from the higher price. Click here for more information on the Grand Bois Extra Léger tires. I had a fluke flat with my Extra Leger tires after only 100 miles when I picked up a sharp flake of rock on a wet road. I really like the black sidewalls, the tan now looks like “white walls”. Let me know when you have black back in stock. We have over 2,000 miles on our Grand Bois Cypres 700x32c tires on our tandem with no flats, and we do ride occassionally on dirt and gravel roads. Doing a tour with panniers around Lake Ontario with the same tires, just carrying a spare, in two weeks. This is THE 700c tandem tire, unless you have caliper brakes. When I changed just the rear the Cypres, I could feel improved comfort as captain. The boys who ride with us on the flats and chase us down the hills have not noticed any loss of speed. 56 mph on Saturday, I did touch the brakes to keep it below 60mph, and only an ex pro stayed on our wheel. I posted comments on it in Double Talk and Jack Goertz was going to call you about carrying them. What pressure do you run in the Cypres on your tandem. I tried them at 100 psi on our tandem with a 290 lb team weight and felt they were less durable at that somewhat high pressure. Still use them on my single though at 70 psi. Any idea if we can expect all-black version in the nearest future? A typo: 250mi = ~400km, not 4000. Thanks, fixed the typo. The all-black tires may come later this year. I would be very grateful to see a photo of what you consider to be the “a little wear” on your rear tire. I don’t have a photo, but what I mean is that the ribs of the tread profile are still all there, but the ones in the center show some discernible wear. On the front tire, the wear is not visible yet, the ribs look as they did when new. Do you plan to keep both black and tan in stock? I am not really that particular over which I use… but I would like both of my tires to match, and since I currently have black sidewalls I am reluctant to switch to tan it I may have to at some point be forced to switch back to black or if black will soon be available. What is your sense for the future availability of these tires I love so much? Our goal is to have all models and colors in stock. However, it’s hard to gauge demand, and the manufacturer doesn’t always make as many as we’d like… but over time, the process should become more straight-forward, and availability should be more consistent. I vote for the tan / red version — love the regular version. Re attached article is it 4000 km (2,500 miles) or 400 km (250 miles). That was a typo when the article was first posted: 4000 km (2500 miles). 400 miles would be extremely short to see wear already. Any chance of a 26″ version some day? I second the question. (Or, a wider version in 26?) Thanks! We are studying the options for 26″ tires. It would be nice to offer many different tires, but the investments are high, and our tires still are very much a niche product with low volumes (in sales, not air volumes!). Jan, I was wondering about the sidewall thickness on the Extra Leger–is it thinner than the standard? I like the idea of a more supple Hetre, but the UV out here in Colorado destroys tan sidewalls with astonishing speed. I’m not sure a thinner one would be a good investment. The sidewalls are thinner. Especially if you park your bike outside, this may be a problem. Maybe customers in Colorado who have used the Extra Léger tires can weigh in? I’ve not had trouble with UV damage to the (Cyprès EL) casings to date, but I don’t store my bike outside, and 1,500-1,800mi is probably the outer limit of the lifespan for these tires given my mix of use etc, so a given tire doesn’t stay on the bike for long anyway. I’d personally be both more concerned with the Hetre’s sidewall sensitivity to exposure, as the Hetre tread bands wear slowly (longer exposure to UV/ozone; also less intensive mileage on my Allroad machine this year), and more intrigued, as the EL casing on the wide-wrap, protective Hetre tread sounds like a good combination for the best uses of that tire. I’m in Arizona, rather than Colorado, but our UV levels are pretty heinous. No problems so far with my Extra Léger tires riding in the Sun six days a week, but I do get to park in the shade when I am at work. The first shipment we got sold out quickly – it was a small quantity we had airmaile while we wait for the bulk of the tires. More will arrive next week (first week of July). We are taking pre-orders, so you can guarantee your spot in the queue. I did not know black walls had been available. . .just ordered another set of tan wall E.L.s. Like the black tread tan wall better than the red treads. still baffled that I missed the black walls !! I’ve ridden stiff, heavy, “flat proof” tires for years, and since purchasing a pair of GB 700×32 extra-leger tires I’ve seen my smile per mile ratio go through the roof and my riding partner get smaller in my mirror. Needless to say I’m pretty happy. Nothing can be perfect and I’ve noticed some, and to my mind, unwarranted fraying of my sidewall threads. Not a lot, and not too deep. Maybe less than ten threads are frayed throughout both sides on both pairs. I don’t think they can be considered cuts, but it gives me an uneasy feeling nevertheless. I’ve ridden them for less than 500 miles and most roads in Japan are paved super smooth. I’ve taken them on some rough stuff a handful of times, but I can’t see how that could do this. Everything is a compromise, this case is no different. I’ll take some speed and comfort over long term durability as long as there is no danger of sidewall blowouts. Been riding 700×32 since this Spring. Mixed urban to suburban roads and paved to crushed limestone trails. Ride is wonderfully smooth and no flats. In fact, cannot tell the difference between Extra Legers and tubulars on the same bike. Well there is one difference: The FMB Paris Roubaix lovely as they are have proven to be flat prone for me anyway. I’ve had the GB Cypres on since March and have also ridden some off-road with NO problems. Love these tires! If there’s any gauge, please consider this a vote/request for 28mm. Thanks for making these tires available at all, I’m very pleased with my 650Bx42mm! I admire the science behind your philosophy on bikes and tires, but for some of us, a tire like this is something I can’t understand. I weigh 220 lbs. When I rode 700 x 28 mm tires with air pressure below 105 psi I suffered two cracked rear rims and innumerable pinch-flats. I’ve had to ride a rim built for a tandem bike on the rear with armored tires at 100+ psi to avoid problems. I recently tried well-known supple tires, 33 mm, and rode the rear at 80-85 psi. I’ve removed it after about 300 miles and two pinch flats and a cut sidewall. Supple casings and low air pressure obviously works for most people, but in my case, I don’t see how the rims and the tires can survive. Anyway, thanks for all the good writing I’ve enjoyed! If you’re getting that many pinch flats on a 28mm tire (assuming, of course, it’s really 28mm wide, and not actually a 24mm with a lying label) at 100 psi I’m guessing you must be “riding heavy” — the opposite of “riding light.” I remember once touring with my daughter — me around 200 at the time, and she maybe 110 lb, and I was carrying most of the gear — when we both rode through a good sized pothole. I “posted” and let the bike rock beneath me, but she stayed planted on the saddle. Both bikes had 27 x 1 1/4″ tires, same brand, inflated to the same pressure (the “inflate to” molded into the sidewall — this was, after all, 30 years ago). She got a pinch flat, I rode right through the bump without a problem. I am quite happy with my new GB Cypres Extra Leger 700×32 tires. I can feel the comfort and speed every time I ride. My riding partner has also seen the drastic change in my speed in the form of getting dropped while climbing in the monkey filled mountains of Japan. One thing that I’m not so sure about is the lack of sidewall durability. I haven’t ridden them for more than 500 miles and they’ve already developed some fraying of the sidewall threads. I have ridden them on some rough gravel and some dirt trails, but it is unexpected to see this so early, or at all. Maybe I’m not used to tires like this, but why can’t they coat the outer portion of the sidewall to prevent this? It seems unwarranted that the casing threads are ripping so early on. Is there anything I can do to prevent further deterioration? Have you seen or heard of this with these tires? Perhaps this is just the tradeoff for speed. If it continues I will have to switch back to safer tires. I guess the Summer 2013 Blog comments are closed, so I post here. Wow! I just got my first issue of Bicycle Quarterly! That’s quite a magazine of yours! To say I’m impressed is an understatement. The thick paper, the readable drawings, the well researched articles, well, merde, I knew it would be good, but I wasn’t expecting THIS good! I sort of feel I’m reading a magazine that’s a cross between Bicycling Magazine, Scientific American, The Magazine Antiques, and a medical journal like JAMA or the NEJM! I don’t think I’ve ever read a bicycling journal that has footnotes! Of course, I would love to see some color photos in BQ, but I’m sure that is prohibitively expensive. Anyway, the Color Photo Supplement online is a great addtion, although your adoring public always wants more from you: I would love to see every picture from the Ca. 1950 Marcadier in color in the Color Photo Supplement. Is the 2 in 21975 superfluous? Anyway, thanks for a great, great enterprise, Monsieur, and to the entire “equipe”. Can you comment on when the lightbulb went off in someone’s head when some tandem maker realized, “Hey, I can make this tandem with 1/3 as less chain than previous models!”? Compare, say, the 1950’s Marcadier tandem, with the 1983 Jack Taylor. Was it just sort of paternalism or do it the way it’s been done before designing that left the shifting crankset up front with the driver, instead of under the stoker’s feet, while all the while of course, keeping the shifting ability with the front rider, to avoid the necessity of driving the tandem in single mode from “the back seat”. Is there any good reason to keep the chainwheels under the feet of the front rider? – You can build a shorter rear triangle, and thus better performance, if you don’t need room for large chainrings at the rear BB. – If you use a lever-operated front derailleur, the captain can operate it. This is my first time riding supple tires. I made the switch after years on super durable and stiff Schwalbes. They “can’t” coat the sidewall because that would inhibit their performance. If you would like to do so yourself, I believe you can just brush on some latex. (I’m not sure of the best form for the use, but I believe hobby (model building) stores might sell something appropriate.) I don’t know how much it would take to eliminate the advantage of the EL casing. The big question is, how long until Challenge gives in and starts making a 650B x 40mm tire for us? I love my Hetres, but more options would be nice.